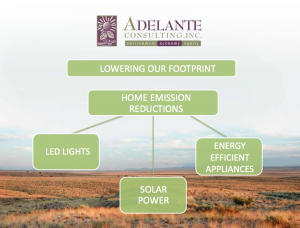 For our own evaluation, we annually monitor each employee’s carbon footprint. Not so we can judge. But so we can look at what each of us can do better. Here are the results from the past two years. 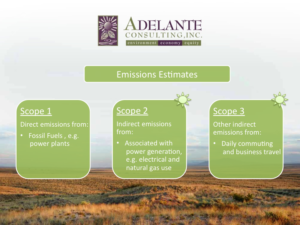 The Adelante Greenhouse Gas (GHG) inventory was completed using The Climate Registry (TCR) approach for small businesses. 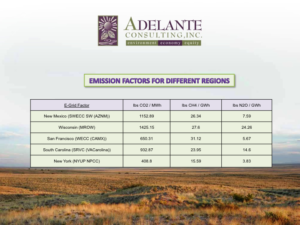 The Green House Gases (GHGs) reported for Adelante were CO2, CH4, and N2O. HFCs and PFCs are refrigerants, and SF6 is a process gas so they are not included. GHGs include: CO2 (Carbon Dioxide), CH4 (Methane), N20 (Nitrous Oxide), HFCs (Hydrofluorocarbons), PFCs (Perfluorocarbons) and SF6 (Sulphur Hexafluoride). 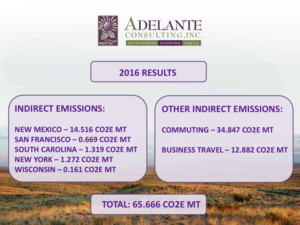 In 2015 the ‘office’ footprint of 10.59 metric tons CO2e for 17 employees.